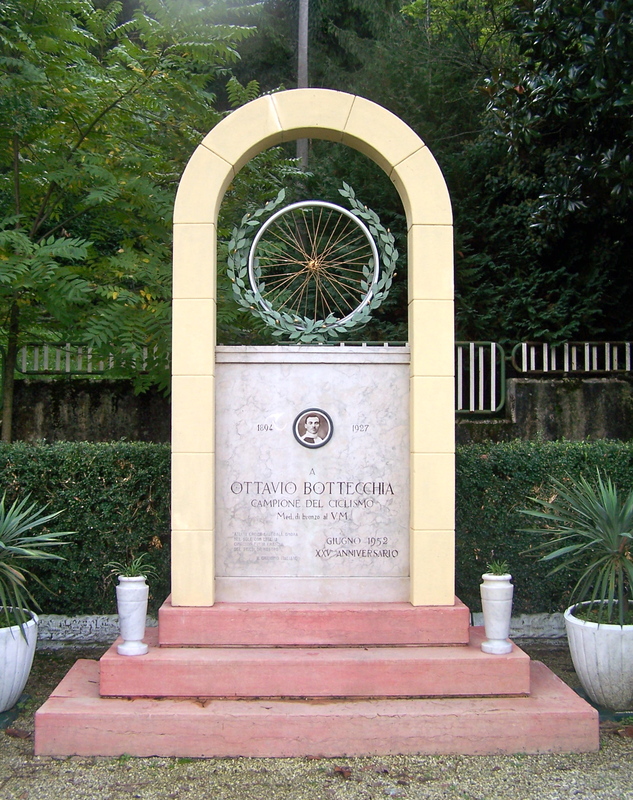 Ottavio Bottecchia was the first Italian winner of the Tour de France, and a cycling legend. His death, which resulted from injuries suffered in a training crash, has always been surrounded by mystery and speculation, and is still the subject of investigations, articles and books. 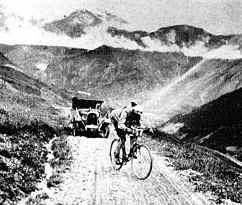 Though Bottecchia died in the Friuli region, leading some to believe he was friulano, he was in fact born in San Martino di Colle Umberto, near Vittorio Veneto in the Treviso province of the Veneto Region. It was only fitting then, that an area cycling club, ASD Ottavio Bottecchia, decided to organize a vintage cycling event in his honor. The second edition of La Ottavio Bottecchia was held this year, and having missed the first one (due to my in-laws’ 50th anniversary party), I was eager to participate. When I arrived at the start outside of Vittorio, I recognized many riders from the VacaMora vintage ride, including the head organizer, Carlo. After signing in and receiving our carnets, numbers, and generous paccchi gara, we posed for photos and then assembled for the start. I scanned the gruppo and realized that I was the only woman rider! No matter. Off we went. The course was enchanting and complex, as the organizers had gone to great lengths to include as many strade bianche and picturesque locales as possible. And so we zig-zagged through the countryside, over hill and dale, across little bridges, down tiny lanes along streams flanked by quaint old mills and hamlets. The relaxed pace allowed for chatting with fellow riders, which is always interesting and enjoyable. As we meandered through the towns and countryside, we passed many elderly people who regarded us with interest, and undoubtedly, nostalgia. I wondered what memories the sight of our jerseys and bicycles stirred up. I like to think that they were good ones. When we arrived at the ristoro, in front of the Museo del Ciclismo Toni Pessot in Caneva, I was amazed and delighted to find volunteers dispensing little squares of grill-toasted polenta topped by either bacon or smoked ricotta. When I complimented one of the organizers for these tasty treats, he beamed and told me, “This is what we used to eat in the old days.” There was, of course, plenty of prosecco as well. Though I had to push my bike up a couple of hills (the lowest gear is 42-26), I was surprised and pleased to make it up the final climb, the appropriately named Via Calvario (Calvary Road). 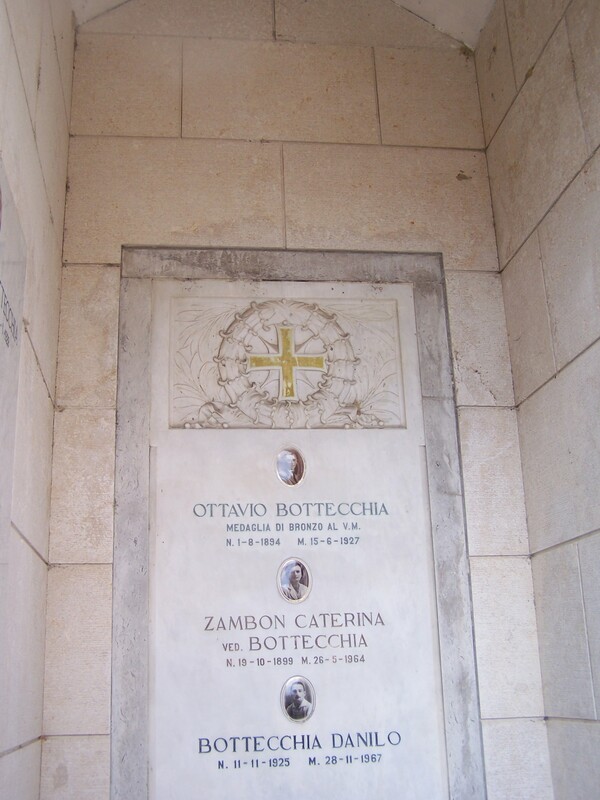 I didn’t realize it at the time, but the cemetery at the top is the final resting place of Bottecchia. After we returned I changed and enjoyed a tasty lunch, then perused the stands of some vendors of vintage gear, as well as an exhibit of cycling photos of local teams and racers of yesteryear. This long history and tradition is what I miss when I’m in the US, along with the opportunity to speak with older people who have so many memories and anecdotes of long ago races and riders. 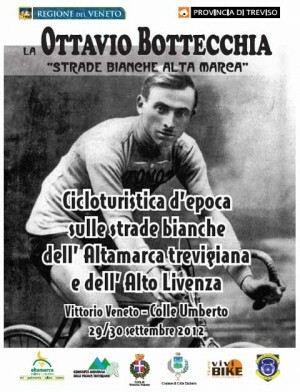 A number of people in the area are actually related to Bottecchia himself. All in all, it was a wonderful day. So immersed was I in the memory of Bottecchia, and the antique atmosphere that pervaded the event and the area, that I didn’t want to let it go. I had ridden the roads he had ridden, and his presence was everywhere. 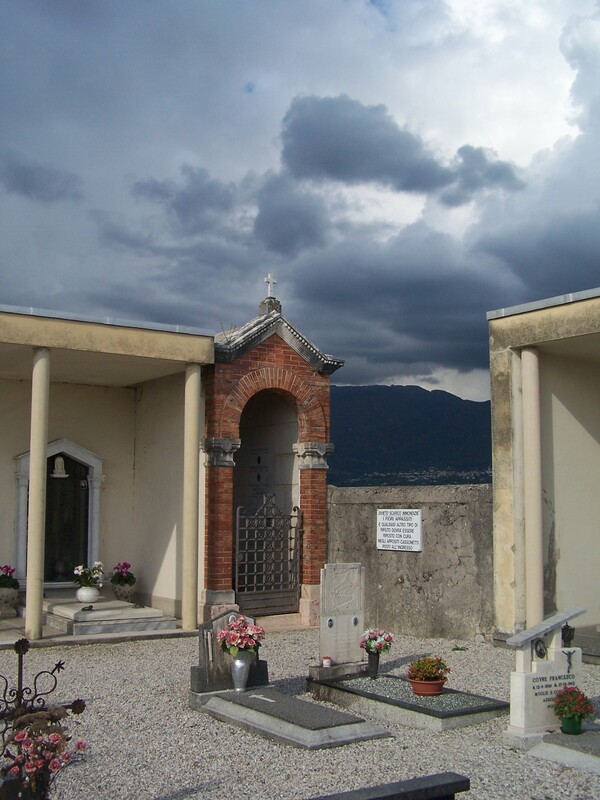 And so, two days later my husband and I returned to Vittorio by car. I had a mission to complete. 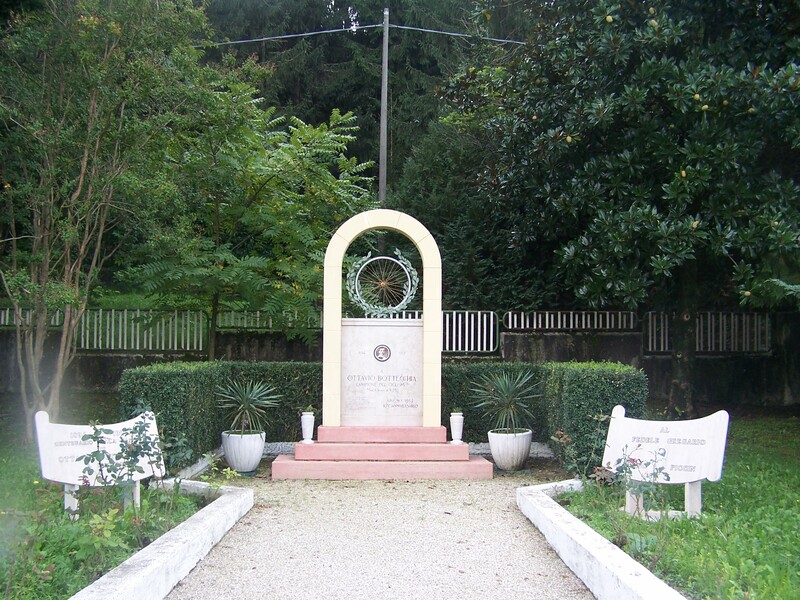 First on the agenda was a visit to the Bottecchia monument, which we found with the help of the ride organizer’s instructions and Google Street view. It was touching to visit the lovingly-created monument to this champion of long ago. Next up was a visit to the nearby house where he supposedly was born. We drove a short distance and recognized the intersection from Street View (giving me once again a peculiar sort of deja vu!). I took a photo of the house, then we went for a coffee in the bar across the street. The owner was a descendant of Bottecchia’s wife. He told us that Bottecchia’s death was not at all mysterious, that he had leaned down to adjust his toe strap and had a dizzy spell which caused him to fall and hit his head. He’d had such spells before. 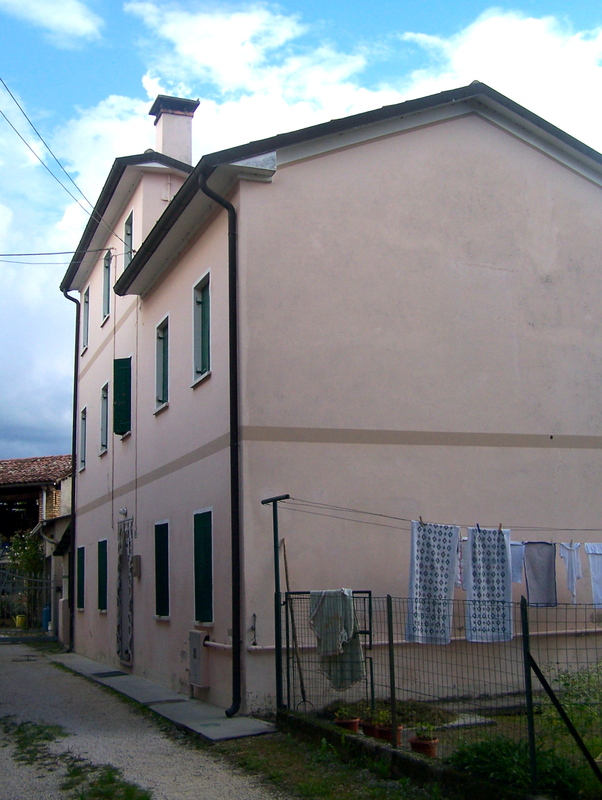 Bottecchia’s wife stated that her husband (who remained alive for some time after the accident) had repeated over and over the word malore, meaning a sudden spell. So it may very well be that, as often happens after the death of a famous, charismatic, and powerful person, no one can believe that his death could be the result of something banal and mundane. Surely there must be something more to it than that. And thus conspiracy theories are born. 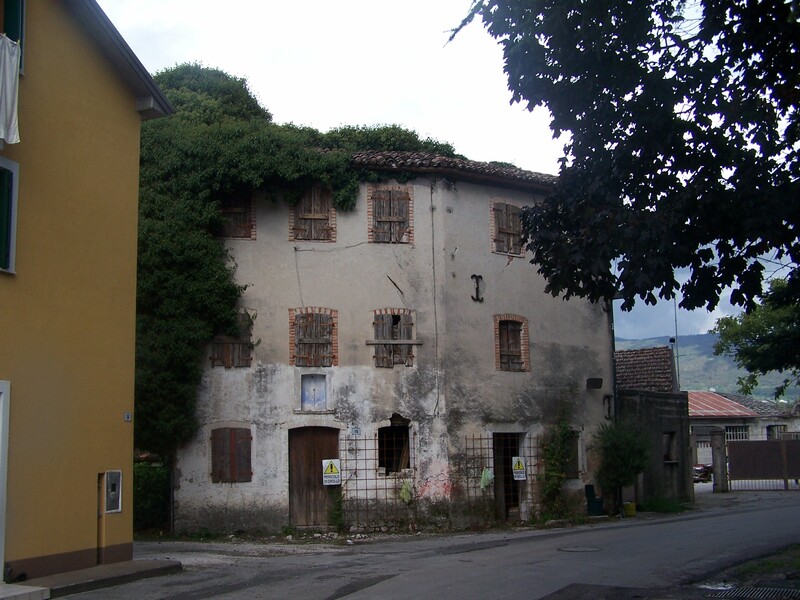 The barman also told us that the dilapidated house I’d photographed had indeed been Bottecchia’s residence for a time, but that his birthplace was actually a restored house next door to it. After thanking the barman for all his useful and interesting information, I walked back across the street to take a photo of the house he’d said was the birthplace. Then we headed off on the last leg of our quest. Once again, we didn’t have to go far: just to the cemetery at the summit of nearby Via Calvario, which I had ridden up just two days before. It was a fitting place for Bottecchia, looking out as it does over fields and meadows, with the Trevisan pre-alps in the near distance and the Dolomites just beyond them. The dark clouds and autumn light imparted a dramatic atmosphere. I stood at his tomb, contemplating that there before me lay the bones of a flesh and blood man who had ridden his heavy, ungeared, bicycle along the unpaved roads that climbed the great mountain passes of France. He’d been incited by the cheers of spectators. His exploits had earned him fame and adulation. Botescià, the French had called him. 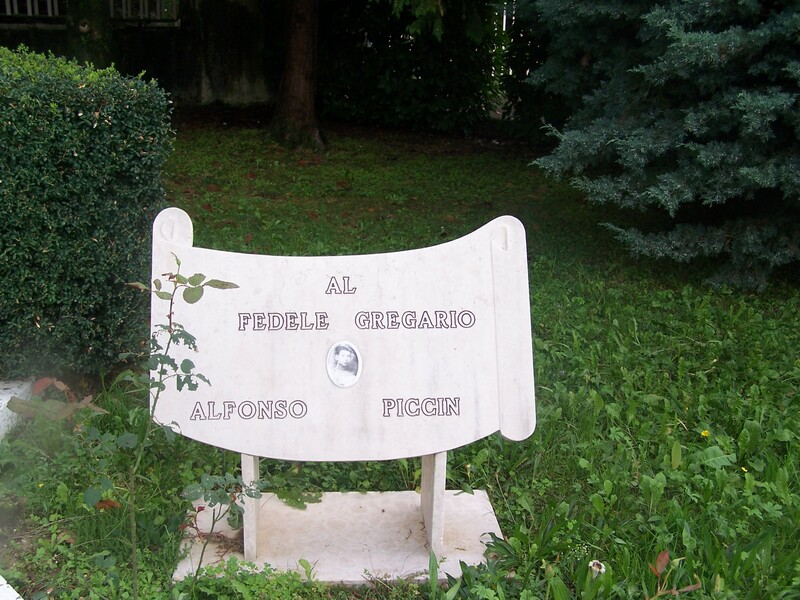 I wished I’d thought to bring some flowers to place on his tomb. I’d never thought much about Bottecchia: he’d lived and raced so long ago, before the memory of anyone alive today. His was just a name from the dusty pages of cycling history. 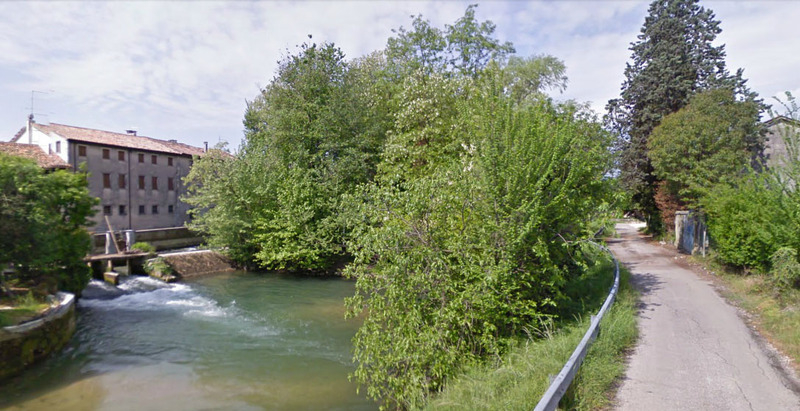 But after riding the event in his honor, seeing the houses where he was born and lived, hearing stories about his life, riding the same roads he rode, and visiting the place where he reposes forever, Bottecchia has become very real to me. I went in search of Bottecchia, and found what I was seeking. This entry was posted in Vintage Rides. Bookmark the permalink. Wonderful story about the great Bottecchia, obviously a very good ride, and good photos at the linked site. Thanks again for giving us these stories that link the present to the past in such warm and straightforward ways. Never as good, that my personal cycling on several ‘Carnielli’ Bottecchia of chosen bikes honours our ‘Emperor Ottavio’ and perhaps an anniversary will take place in 2024/2025 ?